I am a sappy, sentimental girl. I had cameos from both of my grandmothers on my wedding flowers, my sister Debbie’s china, my mom’s wedding ring, and on and on. I love traditions and history and family, and when I find things that combine these loves, I get, well, sappy and often teary eyed. I can’t help it. I just do. (What’s interesting is that my 6 year old has been like this since we can remember…must come naturally to us!). 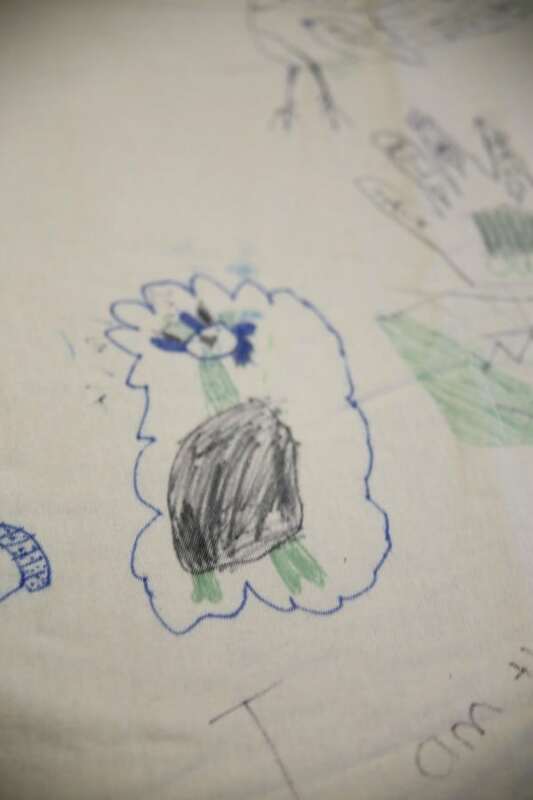 Anyway, someone posted on Facebook once about a new family holiday tradition they were starting, and it involved a white tablecloth, some fabric markers, and a whole lot of memories. 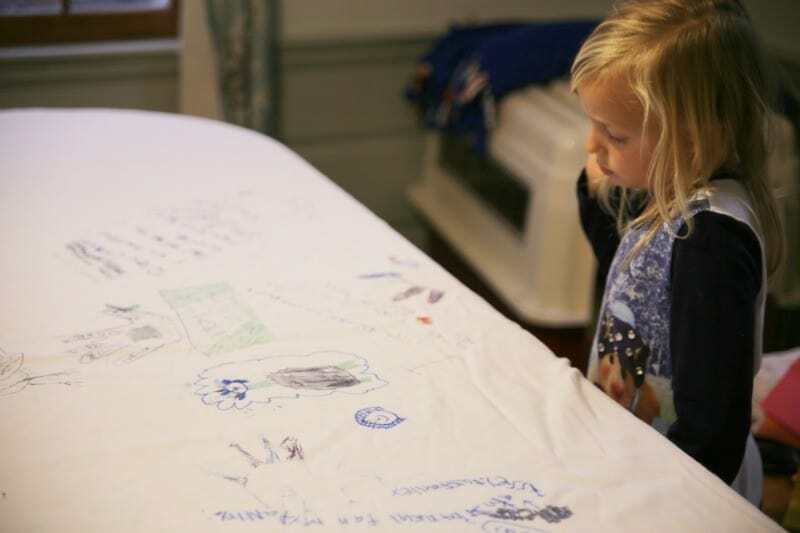 They were using the plain tablecloth on Thanksgiving, but having everyone present write or draw a memory or something they were thankful for on that tablecloth. The idea was that each year, the cloth would be used again, and each year, more memories would be shared, even more to treasure. I fell in love with that idea before I finished reading what it was about. A way to share old memories and make new ones at the same time? Perfect. 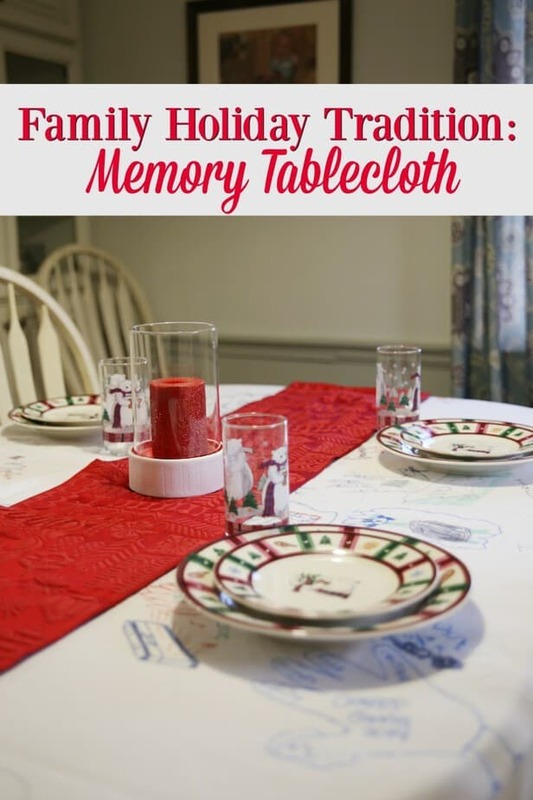 I’m not one to be all, “if only” but when I think about how amazing it would be to have things on our family’s memory tablecloth from those who are no longer with us, I do get a little misty. I try instead to focus on thinking how much they would have loved this idea, and encouraged everyone to follow suit. You might be thinking that I’m a little crazy, and isn’t Thanksgiving- and really, aren’t all holidays- a time to use the best linens with the best dishes? To present as fancy as we can? Well, it may be. But I promise you, my sister’s china set looks just as beautiful on our tablecloth woven with memories as it does on any other linens. It’s maybe not something a designer would choose, but I’m more about the memories made, shared and remembered than appearances. And so each year, we pull this cloth out for Thanksgiving, and have started to also use it at Christmas time. It’s not just for “the” day of holidays, but to gather memories from friends and family who are with us during celebrations. It’s a lot of white and is just starting to look memory-filled, but that’s part of the beauty of this tradition. With a tablecloth full of these memories, and moments of gratitude, I want to take care that none of these images or writing get erased or faded. I obviously don’t want food stains to STAY on this cloth, especially since it’s white. Thanks to my Speed Queen washer and dryer, I have a plethora of settings to both clean and protect this priceless tablecloth so that my family can use it, enjoy it, and add to it for many, many more years. I’m hoping the cloth outlasts the Speed Queen, although the way the Speed Queen machines are built using metal parts and not plastic, I wouldn’t be surprised if it wasn’t the other way around! One reader will win a Family Holiday Traditions Memory Prize Pack from me, myself and I, including a white tablecloth (you can choose round/oval/rectangle/size), a pack of fabric markers and a $50 Visa Gift Card. I am doing this because I love this tradition THAT much and want to help another family to enjoy a meal with loved ones and be able to start this tradition at their house. Enter on the giveway tools widget below. Thank you to Speed Queen for sending us the washer and dryer to use, and for inspiring me to share this treasured part of my family holiday traditions. Opinions are my own. I love putting up the tree right after Thanksgiving dinner with the family. It makes everyone so excited! We like the Speed Queen line of Front Load Washers ! Thank You for the giveaway…decorating Xmas cookies with my Mom & siblings as a kid, and now decorating them with my kids ! We enjoy going out as a family to pick the Christmas tree every year. It’s so magical! I like decorating sugar cookies. I learned that they have a baffle design that helps clean. My favorite tradition is putting out all of the outdoor decorations with my father. We build a big tree out of only lights from the side of the house. My favorite holiday memory is the first one my husband and I spent together. We didn’t have much money, but we were happy with our little Charlie Brown tree. I learned that Speed Queen is tested to last 25 years of reliable performance. My favorite holiday tradition is every Christmas Eve we wear our Christmas pajamas and bake goodies and watch movies. I love Christmas Eve because I get up early and start preparing the dips and foods and drinks and throughout the day, family and friends stop by. It is a constant stream of laughter and chatter and fun. I like that Speed Queen has the stacked washers and dryers. A favorite tradition is our family white elephant gift exchange. My favorite tradition is my son helping me decorate the Christmas Tree. My favorite holiday tradition is our family trip to the local tree farm the weekend after Thanksgiving to pick out the best tree for our family. We have been doing it since our children were little. I learned Speed Queen is a sponsor of mudderella. Our favorite tradition is going out to look at lights on Christmas eve and Santa makes a super special early stop to deliver pj’s or blankies, a movie, a game and a sausage, cheese, cracker etc snack fest to make the waiting for his real visit easier. 🙂 30+ years and still going strong into the next generation with the grandkids. My favorite is the holidays spent with family at my grandparents’. My favorite holiday tradition is making Christmas cookies with my mom. Our favorite family tradition for Christmas is baking Christmas cookies together. I learned that the first Speed Queen® laundry machine was built in Ripon, Wisconsin, in 1908. My favorite holiday tradition is baking sugar cookies with buttercream frosting as a family. We all have different things to when making them and then decorate them together. When they are done we bring them to the local Senior Citizens Home on Christmas Eve. I learned that the company helped support breast cancer research and awareness. My favorite tradition is singing Christmas carols with my family. My favorite holiday memories are of going to my Grandparent’s house every Christmas Eve. My cousins and Aunt and Uncle were there and we would have dinner, open presents and the adults would drink Tom & Jerry’s. I like the Top load washer. I like that my Mom and all of my sisters get together and spend a whole day holiday baking. Having all of us in one kitchen always makes an interesting day. Then we all split up what we made and send baking boxes home to our families. I learned that their washers & dryers are all made in the USA! My favorite tradition is attending the Children’s Christmas Eve mass! Dd has been singing in the choir since she was 4 – she is now 8! This will be her fourth year! I like (aka would like to have) a Speed Queen Front Load Washer. My favorite tradition is watching Elf. we like to open a present on Christmas eve. it is fun! We always have beef fondue on Christmas Eve. Decorating the house and Christmas tree together! 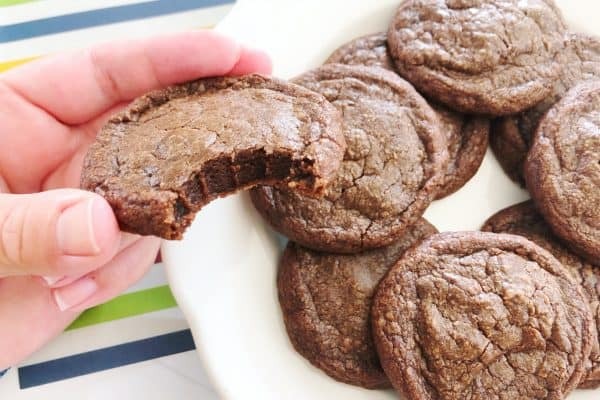 My favorite tradition is baking cookies as a family! It’s messy and fun! I love making and decorating cookies with my family. We love to get together to make Christmas cookies for a cookie exchange. I learned that they are made in America! we love decorating and watching a christmas story! I learned that In mid-September, 2014, Speed Queen partnered with The Breast Cancer Research Foundation® (BCRF) to launch a campaign that has raised more than $20,330 for breast cancer research and awareness. Getting new pajamas and watching The Santa Clause on Christmas Eve!! I learned they’re designed to last 25 years in your home. My favorite holiday tradition is baking and decorating gingerbread men and women with my grandsons! Speed Queen is a great brand. I learned that their machines are manufactured using metal instead of plastic. They are built to last. My favorite holiday memory is watching my Mom open her presents. She took care with every one of them, kept them pretty bows and was always so excited no matter what the gift was. She loved Christmas and they aren’t the same without her. When I went to their web site, I learned that Speed Queen has a blog. We love having the same special foods at our holiday celebrations each year. Our favorite tradition is going to look at Christmas lights on Christmas Eve. My favorite tradition is watching old home movies and pictures from that year on our network hard drive. We love to see the places we have gone or things we have done. Lots of fun! Mom and Dad always made Christmas special. We would celebrate on Christmas Eve because my Dad was a farmer. One year my Uncle brought Shetland Ponies to our home. He even brought one into the house. My favorite memory is getting my first big bicycle – NO TRAINING WHEELS – when I was 7 or 8. Luckily it was unusually nice weather – no snow – so I could ride it all day. I think my most favorite tradition is our Christmas bread. Every Christmas we bake a special bread which has a nut hidden inside. During breakfast everyone chooses a piece of bread. The one who has a slice with the nut gets to open his/her present first. It also helps with the crying and fighting about who can do it first. We usually let the little one choose his slice first and so on. This has been in a tradition in our family for at least 5 generations. I can remember making Christmas cookies with my mom. i like the front loading washers, i learned that they 5x longer warranties for the electrical and 3x for the mechanical. i also learned they have balancing technology. when i was little our family would celebrate both christmas and hanukkah . there was such a small jewish community in our city, and when you are young and most of your friends celebrate christmas it was hard for us to understand. it was great though we got presents for both. we would light the candles every nite and say the prayers and get presents for 8 days and christmas. I learned that they have patented baffles. My favorite tradition is playing the Mrs. Wright gift exchange game. My favorite tradition is making ornaments with the help of my kids every year to hang on our Christmas tree. I like that Speed Queen makes a variety of washers and dryers. 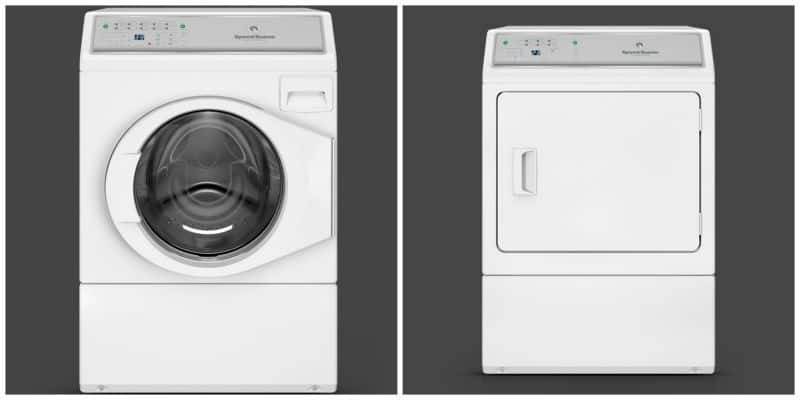 I like that they make a stackable washer and dryer combo. My favorite Holiday tradition is getting the whole family together and going to pick out the perfect Christmas tree! We always decorated our Christmas tree together as family on Thanksgiving evening or the day after. I have such fond memories of that! My favorite tradition is decorating the tree together. I learned that Speed Queen got it start in 1908 by two men who sold hardware. They started the Speed Queen brand name in 1928. Our favorite family tradition is to get together on Christmas morning, open gifts and then eat a large lunch together, usually turkey and ham, along with pumpkin pie. Love this tablecloth idea! Mine is always trimming the tree. It started when I was a kid and we’d make a whole night of it with snacks and songs and now I do it with my kids. My favorite memory was when I received my first computer for Christmas. It was such a great surprise. I hope that my favorite holiday will occur this year. This will be the first Christmas since I was 7 that I have spent with my mother, and I am 46. Each holiday season we see a Christmas play/show. We love having celebration on Christmas Eve, and we have Santa come check on the kids in their beds. 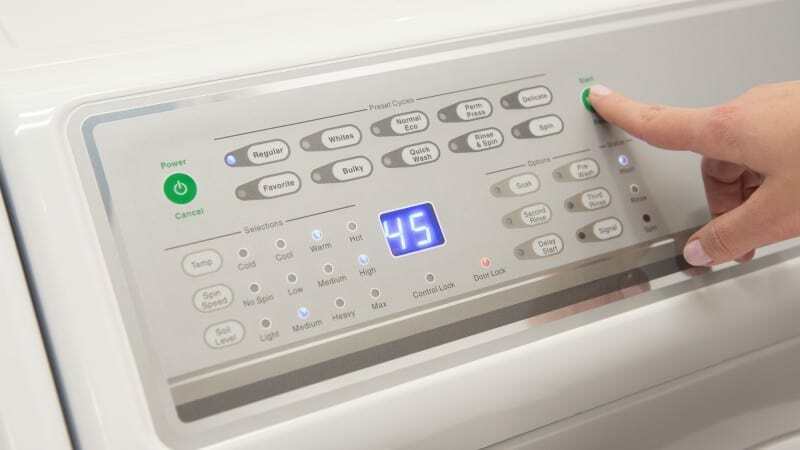 I have Speed Queen washer and dryer and they are some of the best appliances I’ve ever owned. I’d buy them again in a minute but as of now they show no signs of stopping. I’m a retired widow now so I don’t do it any more but for years I had every holiday at my house. I loved having my whole family at our dining room table celebrating Christmas and Easter and Thanksgiving. Those are some of my most treasured memories. My best Christmas memory is many years ago when my mother, grandfather and I used to walk into town, often in the snow, to pick out our Christmas tree from the tree lot and carry it home and then decorate it together on Christmas Eve. I learned Speed Queen’s first electric washer was built in 1911. My favorite memory is the old bubble lights that my mom put on the tree. Speed Queen was my mom’s favorite brand of washer and it is what she always used. I remember her old wringer washer when I was little. My favorite Holiday tradition was the whole family spending the weekend after Thanksgiving going to get the Christmas Tree and decorating the house for Christmas. It was a great time. I like that they partnered with The Breast Cancer Research Foundation® (BCRF) to launch a campaign that has raised more than $20,330 for breast cancer research and awareness. Our favorite tradition is the gathering of the clan for Christmas Eve. Our favorite holiday tradition is christmas eve mass and opening of presents on christmas morning. I learned that Speed Queen equipment is tested to last 25 years in your home. My favorite tradition is that my family and I put two Christmas trees up. One the kids decorate only and the other the whole family decorates. The kids really love having their own tree to decorate. Our favorite tradition is to decorate the tree and then having hot cocoa and cookies afterwards. 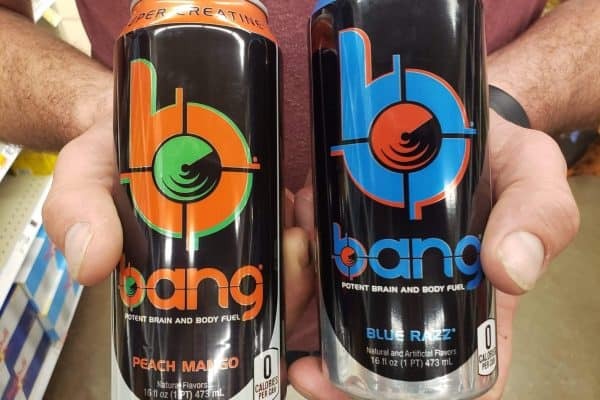 I learned they partnered with the breast cancer foundation to launch a campaign that has raised more than $20,330 for breast cancer research and awareness. Ours is caroling xmas eve. My dad had a life-size manger scene he would display on the front lawn of our house every year with lights and people would come from miles around to “ooh” and “ahhh.” He loved setting that up every year : ) My dad loved Christmas and having his family together. While I miss him not being here to share in making new memories, I will always have that very special memory of him. This is a beautiful family tradition. I like the idea of a memory table cloth. i love this tradition. it is gonna be so cool to see that table cloth in like 10 years. We liked to read a children’s book then decorate our tree like the one in the book. Sitting at the kid table with my uncle and having a good time. What a fun idea!! 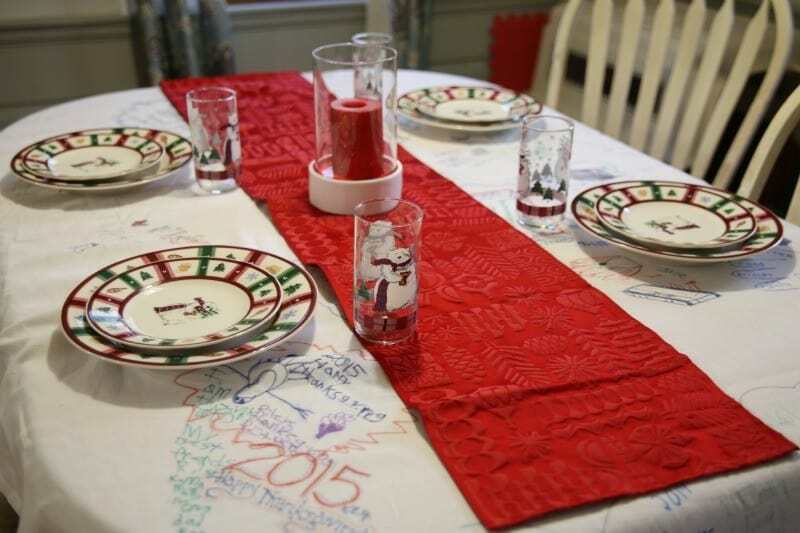 I love this better then best table linens for family holiday dinners! That is such a cool tradition! It will be amazing to see how the tablecloth changes as the years go by. This is such a great idea. I would love to do this with my kids. I will have to share this with my friends with little ones. This post chocked me up a little. I love this idea of the cloth. Stealing that!! What a really creative and unqiue idea. I love this, I’d love to do this especially when my kiddos are older and have their own kids! This is an amazing idea! I wish I would have done something like this years ago. I think I may actually start this during the holidays this year. I love it! It’s nice to look back on memories like this. My favorite is watching Nat. Lampoons Christmas Vacation to start the holidays off on Thanksgiving. Everyone together, laughing, and starting to hang decorations at my moms. I love this idea of a memory table cloth! What a fun tradition that your family can cherish forever! This is a beautiful tradition. You can look at it years from now and bring back some great memories. And what a wonderful giveaway. Someone is going to love this! What a cute tradition. I am in the market for a new dryer too. I learned their first machine was built in 1908 in Ripon, Wisconsin. They employ 1600 workers. We all get the kids something, but amongst the adults we do a secret santa exchange. The money we would have spent on adults, we donate to a local charity or person in need. Now that is an AWESOME idea! I am totally stealing this idea and using it! What a great way to make memories that will last a life time. We have something like this as a Christmas tree skirt. It’s a great way to make family memories that last. I love this idea! I’m sappy and sentimental too and totally relate to the feeling of wishing those who are no longer with us were included in these things. But they are in spirit. This looks like a really durable washer dryer pair, I’d actually love to do laundry if I had that set! I love this idea. I wish I’d done something like this when my daughter was young. It’s such a fantastic way to commemorate the holidays. This is a super cute tradition! I really need to create a tradition I can keep sake, each and every year! 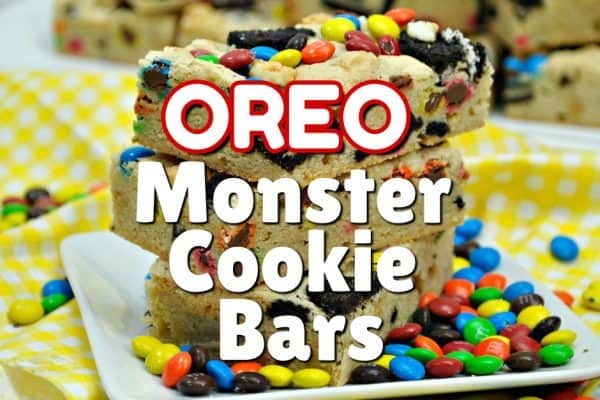 My pregnant hormonal self LOVES this idea! We just moved and have boxes labeled as “Sentimental”. This is such an awesome idea! I want to make one of these with my kids. My sister-in-law started this tablecloth tradition at her home for Thanksgiving, and I want to start this as a new tradition in our house too! One of my favorite memories from Chistmas is a pair of elves that sat on the mantle named No and El! I love this idea! My favorite tradition that my kids and I do is make placards for everyone when we have a holiday dinner!